Your leg muscles are the strongest and toughest muscles in your body. 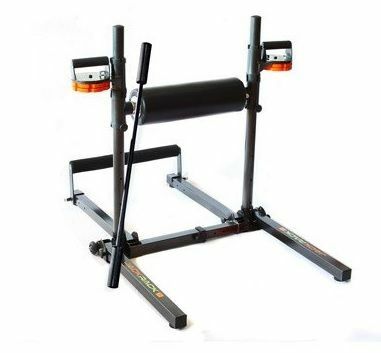 We have built the Bodycraft LF660G Leg Press & Hack Squat with that in mind. From the heavy gauge steel, to the industrial grade linear bearings, this machine is built to withstand the toughest workouts - for a lifetime. shoulders. Another unique exercise provided is a donkey calf, for complete calf development. Extra removable pads allow for Donkey squat by pressing with lower lumbar. This eliminates the spinal compression associated with heavy weights on your shoulders. 2. Hack squats with weight on shoulders. 3. Donkey squats with weight on lumbar. Assembled Dimensions: 102 cm (40”) W x 170 cm (67”) L x 137 cm (54”) H.
We have been getting a lot of queries about the differences between the JACK RACK as seen on Tv and the Platinum JACK RACK PRO. Firstly, the JACK RACK as seen on TV is the entry level home use model. In comparison the Platinum JACK RACK PRO is suited for heavy duty commercial environment. 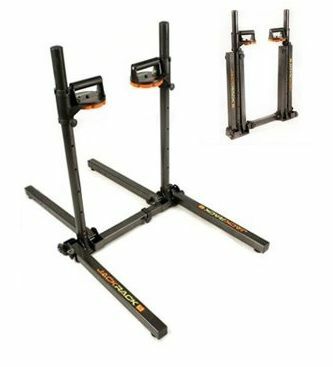 The Platinum JACK RACK PRO has fast stack easy clip on weight plates for quick changeover in comparison to the screw on weight plates for the JACK RACK. The Platinum JACK RACK PRO does not include the nutrition plan or the DVD as it is made for commercial use. 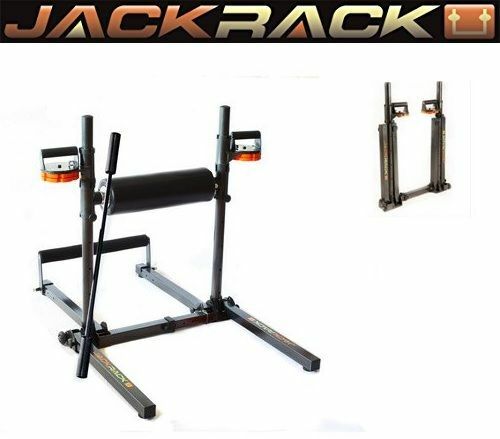 You can use the Platinum JACK RACK PRO at home, in a personal training studio or a fitness Gym. It has wheels at the base for ease of moving around. Work out in the comfort of your home with the Platinum Jack Rack Pro. This rack features over 150 exercises to strengthen your upper body, core and lower body. Including a base unit, two hand grips, a padded bar set, a barbell and four weight plates, this all-in-one gym equipment is your first step to total fitness. As seen on Tv. This home gym equipment folds up for easy storage. Collapsible for storage anywhere and offering a complete fitness plan, the Platinum Jack Rack Pro is a smart buy for improving your health. Base Unit 45 lbs. 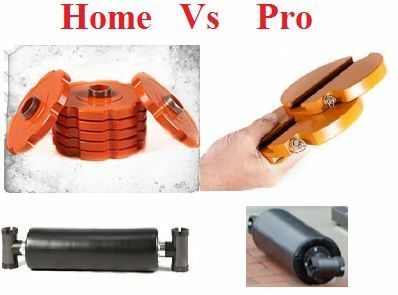 of heavy duty steel able to support 300 lbs. Adjustable floor pads to accommodate uneven floors Folds up for easy storage Adjustable width to adapt to any body size Gliding wheels for simple mobility. Hand Grips Hand grips convert to dumb bells with the addition of 5 lb. weight plates. Each hand grip can hold up to 10 weight plates for a total of 55 lbs. on each side. "Speed Trigger" for rapid adjustments Can rotate 360 degrees; "Turn & Burn Technology" Solid steel construction Foam rubber handles for comfort and secure grip Ability to attach additional 5 lb. weight plates to create dumb bells. Padded Bar Set 8-inch diameter foam padded bar with durable vinyl cover Quick-release pin to convert to roller bar for crunches and jackknives Quick-release pin to convert to roller bar for crunches and jackknives Foam padded foot bar delivers comfort and stability Quick-release pins accommodate rapid transition from one workout to the next Supports body weight and repetitive lifts and pulls. Weight Plates Four 5 lb. weight plates with "fast stack" technology allow for rapid resistance transitions Constructed of solid steel Easy to remove and load on as your endurance grows. Barbell Welded steel construction Molded speed clips for fast transition Non-slip grips for easy lifting and pulling.